Do you read fashion and design blogs? I love them. Am totally addicted. Maybe it's because I'm still trying to shed what's been called my 'uniquely Colorado' sense of style, which is a euphemism anyway. My way of putting clothes together that doesn't exactly fly in Manhattan. One of my good friends used to describe me as the girl who wore puffy vests. It might also be because my apartment is pretty much exclusively "decorated" with cheap bookshelves that kind of sag and bow in the middle, and sometimes just fall apart completely. In both fashion and design I like to live vicariously. One of my favorite themes that seems to get used a lot by people with an eye for both fashion and design is to focus on one color. Orange, or white for example. Now, as I said, I have an eye for neither really. 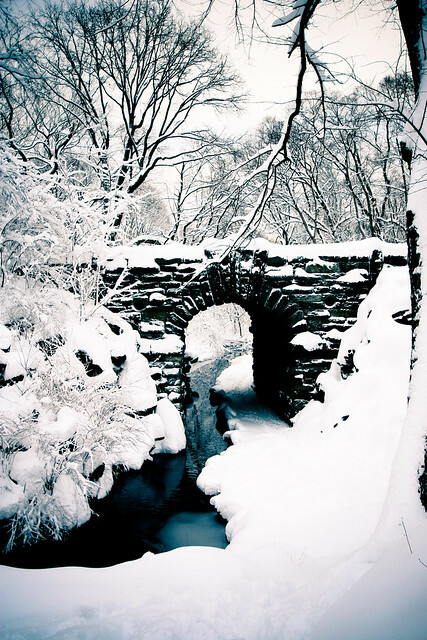 But New York is so blanketed in snow right now that white is an almost self-evident theme. 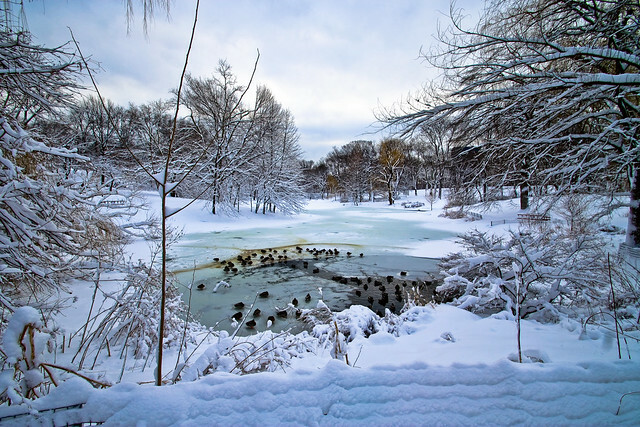 I wasn't here for the massive post-Christmas blizzard we had because I was at home in Colorado, and this time I vowed not to miss one of the most amazing experiences New York has to offer in the winter: a walk through a blanketed, and still-pristine Central Park. 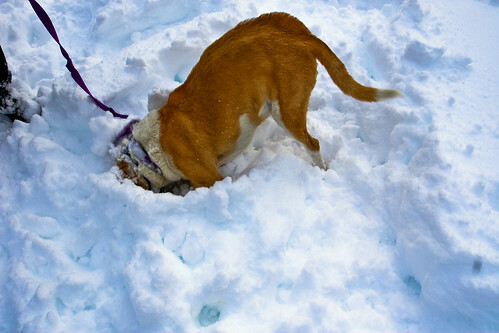 Lucky for me, I had a couple of puppies happy for the chance to go snow-snorkeling. A favorite activity of almost every dog I know. And of course, what goes with white snow, if we're going to uphold our theme? White food! 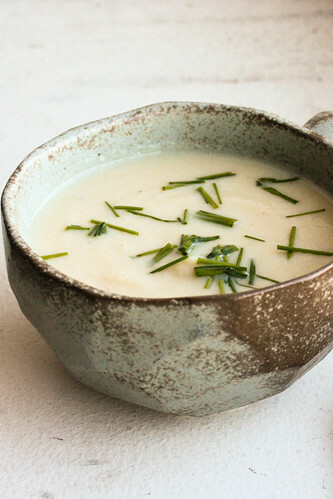 White soup, more specifically, and a white cauliflower soup to be exact. R remembers eating something similar all the time in Norway (another place that fits in so well with our winter white theme), where he says his mother used to make it frequently. I was going to get her recipe, but by chance I had a number of things to be used up in the fridge, a leek for example, and half a carton of milk, that I thought I had this one under control. It's a light cauliflower soup, made with skim milk rather than heavy cream, some vegetable stock, a leek and a head of white cauliflower. Really, it could not be easier. And it turns out that, although I doubted it at first, cauliflower soup is incredibly satisfying. There's something potato-y about the texture, which is smooth and hearty and incredibly warming. R kept asking, as we slurped down our soup, if I was surprised at how good it was. He has this ability, that boy, of kind of reassigning credit even if I made, and made up, the soup. But the truth is, I was surprised by that humble little cauliflower. It was delicious. In a large soup pot, heat some oil over medium heat. Add the leeks and cook for about 5 minutes until softened. Add the cauliflower, the 3 cups skim milk, and the 2 cups stock. Bring to a boil, then reduce the heat and simmer. Cook until the cauliflower is cooked through and can be easily broken apart by a spoon. Don't worry if the liquid doesn't cover the cauliflower, it will steam anyway and be fine. Since this soup is meant to be easy, just use an immersion blender if you have one to blend the soup, but take it off the heat first. If not, you can use a regular blender and then just transfer the puréed soup back to the pot when it's done. The soup will be pretty thick at this point, so return it to the heat and add more milk or stock to thin it out until it's the consistency you like. Warm it up a bit so the addition of the milk/stock doesn't cool it too much. Season to taste with salt and pepper. Ladle into bowls, and add a handful of chopped chives to each serving. I just use kitchen sheers to cut the chives directly over each bowl. Heh. I know what you mean about the puffy vests - I do that too! A friend told me a couple of weeks ago that I was in a "Pacific Northwest fashion rut" when I complained that all I wear anymore are jeans and sweaters. It's just too cold to wear anything else! Beautiful photos, by the way. I just love snow. Looks delicious! We'd love for you to share your recipe and images at dishfolio.com! Really looks delicious, and I love that bowl/mug! So rustic and made for such lovely photos. 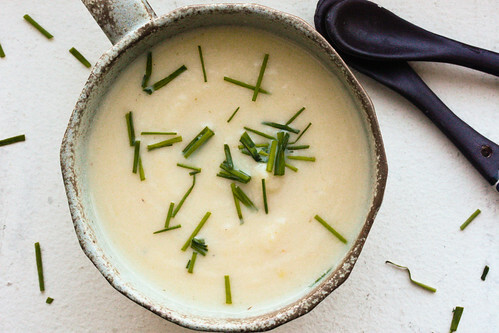 I can't get enough of leeks lately, and they sound wonderful included in this soup. I just made this soup tonight. It's delicious and so easy. I used a potato masher rather than a blender or processor resulting in a more rustic look and texture. This is something that I'll make again and again. Thanks for the recipe!